A couple weeks ago, I did a long-overdue cleanup of our washroom, which tends to become a catch-all for a variety of stuff. It's not a large room, and some of the crowded floor space is taken up by two very important things: 50-gallon barrels of water. We've kept these barrels in the washroom ever since the November 2015 windstorm devastated our region. We've dipped into those barrels more than once, notably last June when our well pump died and we had no water for a couple of days. 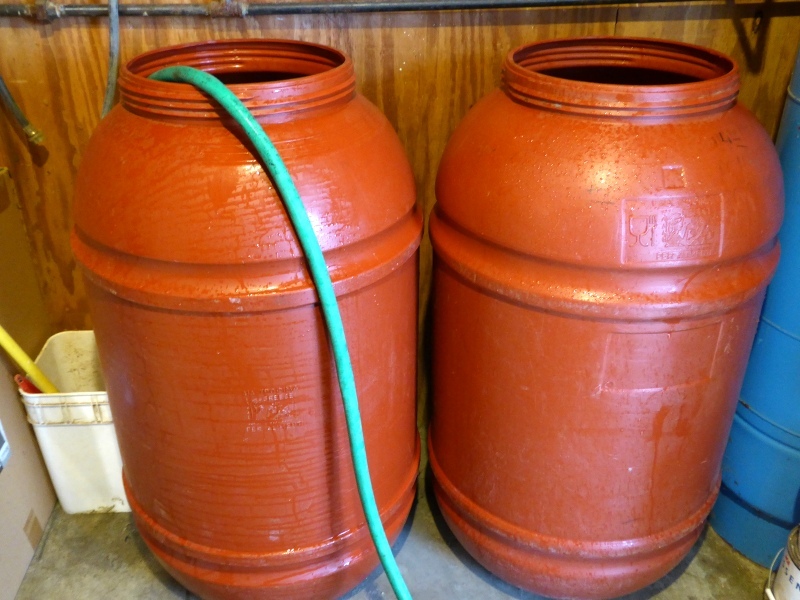 But it's important to freshen stored water once in a while, so I emptied the barrels (the water was crystal clear), rinsed them, then refilled. To each barrel I added five teaspoons of fresh bleach before tightening the lids. The combination of darkness and bleach keeps the water fresh and pure. I told Don afterward that having those barrels filled with fresh water gives me a nice fuzzy comfortable feeling. 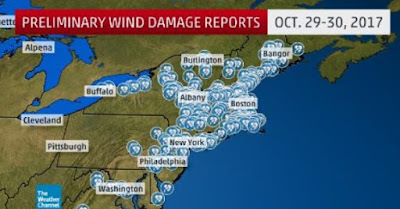 I have a cyber-friend in Maine who just experienced something similar to our 2015 windstorm. Thankfully this friend is a prepper. She wrote: "We had most of the state without power for about a week. The windstorm last Monday caused quite a mess. It's amazing how unprepared my coworkers were for this. The power died last Monday morning and the general thoughts were, 'It's in the 60s so no problem with no electric heat.' No one thought about what was going to happen when it dropped into the 30s that night. We have a generator, which I am grateful for. It wasn’t cool enough to throw the freezer and fridge stuff outside during the day as it was in the 40s and 50s. No one appears to have learned their lessons either. You can't fix stupid." My friend added these staggering words: "I can't believe how some folks really have their heads in the sand. Our generator cost a lot but it's worth every penny. I have a coworker who said she would rather buy new clothes, furniture, etc. than a generator because a storm like that is likely not to happen for another 100 years!" You can't fix stupid, indeed. The lesson to be learned here is this: Don't bother preparing for a zombie apocalypse. That's science fiction, folks. It's best to prepare for what you're most likely to face, including natural disasters specific to your region. I'm glad my cyber-friend is a prepper. Here in coastal MA we had the same storm. While we don't have a generator (its on the someday list), we do have a wood stove that we invested in. We only lost power for about 24 hours. It was amazing talking to neighbors and the complaints of how long it was taking, watching them keep calling the power company for updates, worrying about how to keep warm that night. I was even told how I was lucky to have the wood stove, it wasn't luck, we chose to spend the money on that and wood for just such an occasion! All in all my children were quite comfortable, with the biggest change being eating dinner by lantern, which I think we will do more often now. You are so right, prepare for the obvious, the likely, that is what will keep you comfortable and maybe even save your life. If only the neighbors bought that generator instead of that new car. Thank you for such a great blog. I have been a frequent reader for several years now and it has changed how our family prioritizes many things. The whole idea of preparedness was a very foreign concept to me and my husband growing up, but it won't be for our children. They ARE the zombie apocalypse... And there are A LOT of them. I assume the containers are food grade? Can you tell me where you purchased them? I've always thought that if I am prepped for zombies, I am also ready for just about anything else. Actually, that's a very good point, ha ha. Nobody's really come up with a good answer for whether it's safe to eat zombies if you're rich in zombies, adequate in fuel, poor in ammunition, and blocked from reaching your extra supplies in storage sheds. My guess is that if you were so inclined to try this out of desperation, you could possibly achieve the desired uncontaminated results with a pressure cooker and sufficient time. But do you really want to have to sacrifice the family pet just to find out whether you're right?